To take Music at Bilborough Sixth Form College you must have strong performing skills at or above Grade 5. ABRSM, Trinity and Rockschool grades are all acceptable. If you have not taken formal graded exams, but can confidently perform to a Grade 5 level, you are welcome to participate on the course. An understanding of music theory is also essential. The course demands performing, composing, listening and analytical skills in almost equal measure. You will listen to a wide variety of music and develop a more informed appreciation of how and why it was written and performed. All our Music students are expected to take an active role in the musical life of the college, getting involved in concerts, productions and ensembles. To study Music at Bilborough, you will need performance skills at grade 5 level or the equivalent level of experience. You should ideally have a grade 5 standard in Music Theory too or have the equivalent experience. 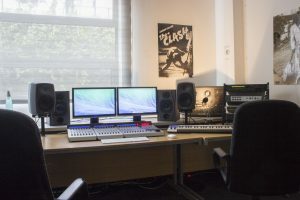 Some of our students opt to take both Music and Music Technology. This is a sensible choice for able students who intend to continue studying music in higher education, although you are always well advised to consult the specific entry requirements of individual universities. If in doubt, please ask us. An A-level in Music can lead to further study in Music, Music Technology or Performing Arts at Higher National or degree level. It may also help you on your way to a career in the music industry. 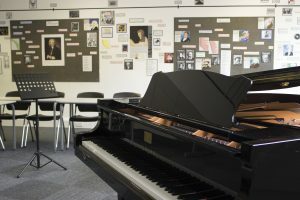 Musically gifted students can also progress to performance-based courses at music conservatoires after their time at Bilborough. Students have the freedom to choose 2 areas of study which suit their own personal preference, experience and interest. Students develop their skills as a musical performer throughout the A-level course. You can perform on any musical instrument or you can sing either as a soloist or in an ensemble. You will perform a set of pieces of your choice, with or without accompaniment, lasting a minimum of 10 minutes. This unit is externally assessed using a recording of your performance at the end of year 2. In this unit you will learn the craft of composing. You will develop musical ideas in the form of two compositions totalling a minimum of four and a half minutes. You must write one composition in response to a set brief (based on the areas of study above) by AQA and one composition to a Free Brief of your own choice. All work is completed under supervised conditions and students must produce a musical score in traditional notation or written form, a 150-word programme note and a set of high quality recordings. Work is externally assessed at the end of year 2. Bilborough Sixth Form College’s gifted musicians have won places at the Royal Academy of Music, the Royal College of Music, Trinity Laban Conservatoire of Music & Dance, the Royal Northern College of Music, Birmingham Conservatoire, Leeds College of Music, the Royal Welsh College of Music & Drama and the Liverpool Institute of Performing Arts. Our students have also progressed to Music degrees at Oxbridge, the University of York, Durham University, the University of Nottingham, the University of Leeds and the University of Sheffield.